29" x 29" (73.5 x 73.5) cm. 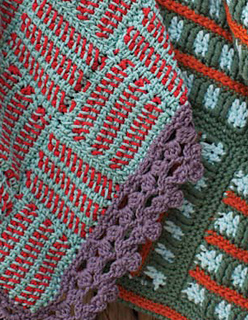 As with scarves, blankets are never worn on just the right side; so why not make both sides look great? 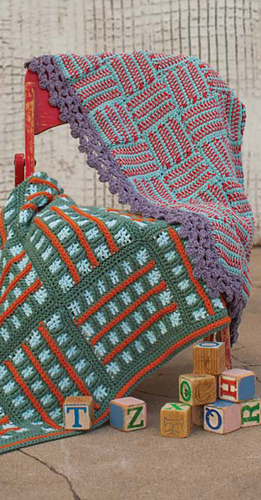 This color stitch pattern is a simple step into color by just using each new color at beginning of the row. 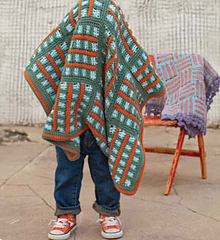 The slip stitches in the pattern add a touch of texture to the blanket that makes it extra cuddly for little hands. Yarn: Worsted Weight (4# Medium). Shown: Berroco, Comfort (50% Super Fine Nylon, 50% Super Fine Acrylic; 210 yd 193 m/3.5 oz 100 g): #9744 teal (MC), 3 skeins; #9714 robins egg(CC1), 2 skeins; #9724 pumpkin (CC2), 1 skein. Hook: J/10 (6 mm) or hook needed to obtain gauge.